Wickham Skeith, Suffolk seems at first like two villages, one on the high ground based mainly around the village green and one on the lower part along The Street which runs parallel to the River Dove. Wickham Skeith is situated about 5 miles to the west of Eye and about 3 miles east of Finningham. The Rectory Hall was rebuilt in 1846 and is a classic piece of mid-19th-century brick architecture, especially with its ‘twisting’ chimneys. The 14th-century church, situated on the outside edge of the village towards Thornham Magna, is dedicated to St. Andrew and the parochial register dates from 1682. There is also a village hall still in use next to what was the old primary school on the village green. 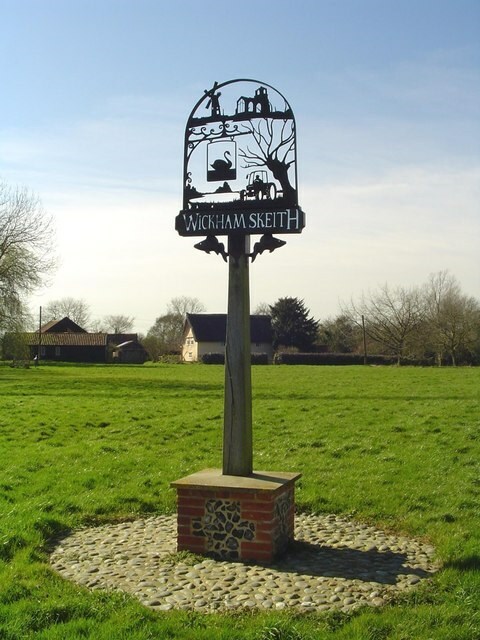 The village of Wickham Skeith is at least a thousand years old and mentioned in the Magna Carta of 1215. Throughout that time agriculture has been at the centre of village life. Inevitably, the last fifty years has been a time of great change with a decline in employment on the land. There was a windmill and steam mill on the village green and, on 13 January 1890, the boiler of the steam mill exploded. (A flying brick struck 6 year old Edward Rosier on the head, breaking his skull. He died on 5 February from "compression of the brain"). Possibly the last "swimming" or "dunking" in the country as a test of witchcraft occurred at Wickham Skeith in 1825. Isaac Stebbings, a pedlar aged about 67, was accused of black magic and driving two people (a thatcher's wife and a farmer) insane. He was immersed in the Grimmer and floated three times - considered a positive indication of guilt in those times. A second trial was planned for the following week, but the clergyman and churchwardens intervened and kept people away from the Grimmer. Three woman were also found to be guilty by a witchfinder general, but mostly of deviating from the religious line of the local church. No records seem to exist as to their demise, natural or otherwise. If the village hadn’t been strafed by a rogue German ME109 fighter (probably looking for the American USAAF bomber air base near Eye but he got the village shop instead), World War II would have gone by unnoticed in this farming village except by those who lost their sons on active service. The population in 2001 was just over 300, a decline from a hundred years ago when many villagers worked on the land. The census for 1901 shows a population of 415, while in 1851 613 people lived in the parish. There was a village school, forges, two mills, a pub (the renowned Swan Inn), a chapel and a village shop, now all gone or turned into residential housing.